Iluminar has announced a new IR illuminator for use in 'super' covert applications. Iluminar claims this model is completely invisible due to 1030nm IR LEDs, unlike 850nm or even 940nm LEDs, typically regarded as covert. In this note, we examine the features and pricing of this illuminator compared to traditional IR illuminators. The IR312-D series is the first product released by Iluminar using 1030nm IR LEDs. It is rated for a throw distance of 10m/~33' with a 60° angle of illumination. The illuminator requires 12-32VDC or 24VAC power, and is equipped with a built-in photocell. Illuminar's claim is that 1030nm IR LEDs are 100% invisible to the naked eye. While 850nm LEDs are known to emit a red glow, 940nm illuminators, generally regarded as "covert", are also detectable. Especially at higher powers, this causes a slight glow as the bottom end of the 940nm frequencies reaches the visible spectrum. Some manufacturers, such as Bosch, use a separate cover to reduce this glow. While many or most applications will accept the glow from IR LEDs, there are some high-end applications in which it is unacceptable. Users in military and municipal surveillance especially, when deploying covert camera systems or performing nighttime surveillance, do not wish to reveal a camera's position. In some military applications, this may also reveal a unit's position, putting them at risk. As a result of tihs roll-off in sensitivity, imagers may produce weak image, or no image at all in some cases. 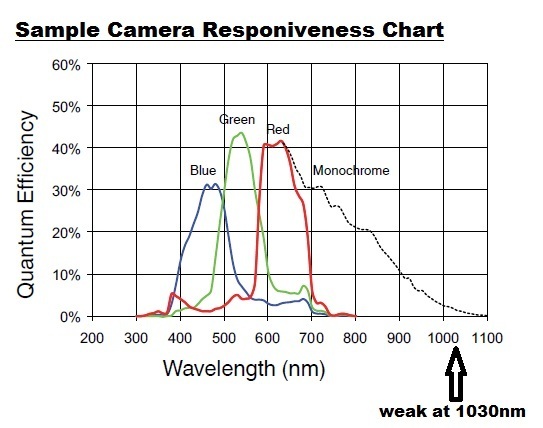 Users should be aware of this when specifying cameras, or 850nm/940nm illuminators should be used. Currently, we know of no other manufacturers providing 1030nm IR illuminators for surveillance. The IR312-D is priced at $10,500 MSRP, which is a huge premium over 850nm/940nm models. For instance, Iluminar offers similarly powered models in these ranges (also the IR312 series) for an MSRP of $590, making the 1030nm model almost twenty times the price of other units. We expect that for high end applications that absolutely must be invisible, this price may be less of an issue. Others will likely continue to accept some LED glow. We asked Bosch about the 1030nm range vs. 940nm issue. In lieu of 1030nm illuminators, which are not currently available in their line, they suggested running 940nm illuinators at lower power would reduce or eliminate the glow. Using more LEDs at lower power can reduce the trailing into the visible spectrum. UPDATE: Raytec reports that starting in January 2012, all 940nm illuminators models will be outfited with a diffuser and long pass filter. This be provided at no additional cost. Raytec says the diffuser spreads the light out so the small amount of visible light is dissipated over a wider source area and that the 900nm long pass filter significnatly reduce the light output below.